All figures are generated from Mint.com. As you can I picked up almost $17,000 over the last couple of months. The only account that appears to have gone down is my house. The value fell from $138k to $131,000. Not sure why, but doesn't really matter. It's good to see these numbers increasing. As I mentioned in my Dividend Post, there have been a lot of changes going on at work and not for the better. I have held on to my current position so far, however between the management changes and a subsequent fall off in business that may change quickly. It's good to have a huge safety net!! 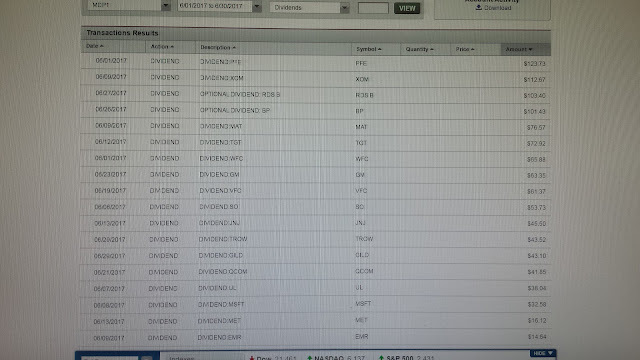 Here are the dividends I received from last month. 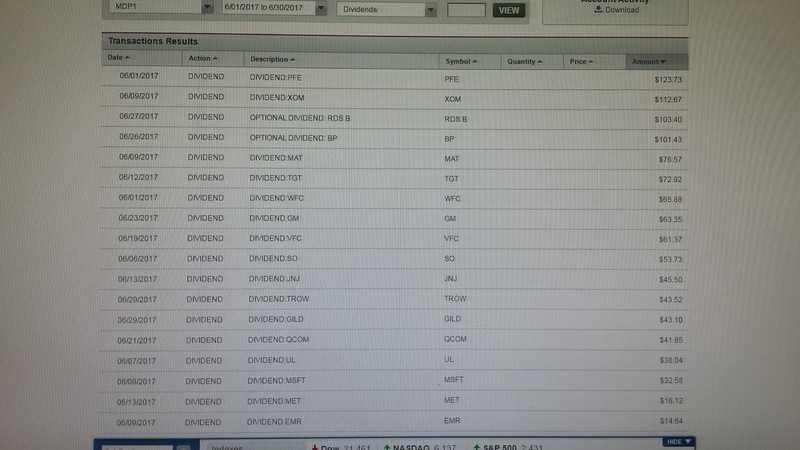 Total dividend income in my taxable account $1127.00. That was a great month!! Things at work have become very complicated and with new upper management changes are happening almost daily. Most likely I will be demoted and half my salary cut in half. That's option isn't anything to cry about as I still would be making six figures. The other two options are I am fired or I choose not to work in an unbearable work environment. Because of these new circumstances, I decided to liquidate my entire portfolio. I now have about $400,000 sitting in cash. I also still have about $320,000 sitting in my 401k which is invested 65/35 in S&P 500 and Vanguard bonds. Since I am 46 right now, I may actually be financially independent. I will see how thing play out over the coming months and will make a decision about whether or not I get back into the market and how much I will invest.